Up until recently, the mens velvet blazer and dinner jacket was all but ignored in the fashion world. It seems that those who are fashionably dressed deemed the blazer,dinner jacket or sport coat as old fashioned and fuddy duddy. Not anymore. Something came back into the fashion world over the horizon which was in style about thirty years ago. The Velvet Blazer. Yes, the velvet sport coat. Like so many other Mens Blazers that go away and come back a generation later to take over with Stacy Adams Shoes. Another way to wear a mens velvet blazer of course is with a nice pair of dark color dress pants. With your favorite pair of well polished dress shoes. Please don't wear those old beaters buried in the bottom of your closet. It just doesn't work. If your shoes look good, then you'll look good. That's my Mantra. Feel Free to shop online at ContempoSuits.com for Zoot Suits Get formal quick with your Tuxedo. Whether you like solid colors, stripes or plaid, our Mens Suits will please. If you like genuine skin Crocodile shoes try some Belvedere Shoes. 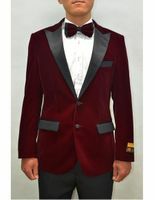 Mens velvet blazers and dinner jackets like so many other garments from long ago has made a comeback and good one at that. The difference is the fabric and how a mens velvet blazer should be worn. Like all fashion, things that come back into style come back in a changed manner. 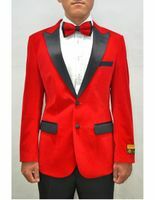 The cut of the coat, width and style of the lapels, fabric and what to wear mens velvet blazers with have all changed. Everything about the velvet sport coat is modern now. Not a 1970s relic whatsoever. The fabric is no longer feels like it was made from a cheap sofa. Textile manufacturers go out of their way to make sure that the velvet they are manufacturing has a soft and luxurious hand. 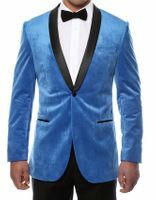 These new mens velvet blazers and dinner jackets are made of cotton velvet which has a soft feel. Very luxurious to the touch. Old fashioned velvet was more like the stuff they put on those red lint brushes. Not this velvet. Although some men might refer to them as a velvet suit jacket, that is simply not the right term because a velvet suit jacket would suggest that this is part of an actual suit when this is simply an article to be worn with other slacks. There are a couple of different types of velvet blazers available. The first being the more traditional looking suit jacket style. That is primarily a single breasted blazer jacket with notch style lapels and your classic flap style pockets in front. The blazer may or may not have side vents in the back. It really depends on the style at the moment. In this era, side vents are definitely in vogue, so that is what you're going to find everywhere. 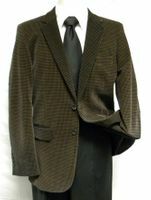 The second main type of velvet blazer is the tuxedo jacket style variety. This blazer most certainly has that black tie sort of thing going on with it's shiny black satin lapels and satin covered buttons deeming this blazer a tuxedo jacket. You will find that color is never just black and you can find these velvet blazers in many fashion colors for whatever whim you may happen to have from your basic black of course to navy blue to burgundy. Then it can get crazy with bold colors like red, orange and yellow as well. There really isn't any color that velvet blazers are not made in these days. Now if you don't go crazy with style and fashion, your best bet would be to go with your more basic style of velvet blazer. This is the most versatile jacket that can worn dressed up with a button down shirt and even a tie if you wish and some nice slacks or dress the blazer down big time with some nice jeans, a more casual button down shirt and something interesting on your feet like some nice Mezlan shoes. During the Fall and Winter months, you can really let your sense of style come through when you wear a velvet blazer. The fabric of velvet is certainly mesmerizing as well. If you are single and go to clubs on Friday and Saturday nights, do not be surprises if ladies you are striking up conversation with don't happen to not be able to resist feeling the velvet fabric on your blazer. Don't ever try that with the ladies though and feel their fabric. Did you ever watch that Seinfeld episode. Velvet Blazers can be dressed up or down. Velvet blazers and dinner jackets do have a certain way about them. They seem to look great in a casual manner of dress such as with a pair of jeans and a dress shirt. Fantastic Club Attire. I've seen some guys wear them with French Cuff dress shirts with the french cuffs folded over the bottom of the sleeve of the sport coat. Now that look will only work in a casual setting. Don't try it at work on casual Fridays. Just a little too risque for the boss. Velvet blazers are really for wearing when you're on you're own clock enjoying the fruits of your labor. Let's say you are the type of man who when going out throws on a button down shirt with a sweater on top of that. Pretty standard right. How about doing something a bit more exciting and keeping that sweater in the drawer it belongs in and wear what you're wearing with a velvet blazer instead. All of a sudden, instead of looking like some mild mannered teacher or someone's dad, you have some style going on just because you're wearing a velvet blazer instead. Here's a little insight. Don't think that you'll be missing the comfort and warmth of the sweater you were going to wear because the velvet blazer will make a great substitution and you will be extremely comfortable wearing it and may even like the feeling of wearing the blazer better than wearing the sweater. Try wearing a velvet blazer instead of a sweater. If you're old enough to remember style and fashion from the very early 1990s, you would have remembered a look that involved a Melton fabric blazer that was a thicker and soft type of fabric that was worn equally by both men and women especially in New York. The velvet blazer sort of mimics that whole look from back then except stay away from those Dan Post cowboy boots that were worn with those blazers back then and pull out the shoulder pads as well. The modern day velvet blazer has more tailored fit that just looks perfect with our modern era of style. No more broad padded shoulders, baggy fit and closed back styles permitted. Let that era stay right where it is and move forward. 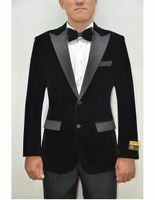 Wear a Tuxedo Style Velvet Blazer for Black Tie events. Now, if you're going for the whole black tie thing with a velvet blazer, You need to make sure that your blazer is up to snuff for that whole black tie thing. I'm talking satin here. You need to make sure that if you're going to go black tie, the velvet blazer that you choose to wear needs to have the following on it. Satin lapels and satin covered buttons which express the fact that the blazer you're wearing has a more formal look. Your basic velvet blazer simply just won't look right in an actual formal setting because it will have basic buttons where you see the actual stitches on them and plain velvet lapels. It will look like you are just wearing a casual looking blazer in a formal setting. When you have to go some where special, it always matters how you dress and when the time comes for a black tie event. You need to go that extra mile do it right the first time. So, as you can see, the velvet blazer is not your one trick pony, nor should it be. The comfort and style that velvet blazers possess will have you wearing them on a regular basis once you discover how great they look on you and how comfortable they feel on you. You'll break the ice getting yourself one color and soon get yourself another color looking for any excuse to wear it.